As part of integrating SOATEST with Cucumber, first step is to install maven from eclipse marketplace. Unfortunately maven installation is interrupted in middle & showing error. Looking at many post on different forums it seems the maven version is not compatible with the Parasoft/Eclipse version on my machine. Can you please let me know the maven version to be installed? & How we decide which maven version goes with which Parasoft/Eclipse version? Also, you are not installing Apache Maven but Eclipse m2e which enables Eclipse to build maven java projects. Please also consider upgrading for the latest functionality and fixes. Both SOAtest 9.6 and Eclipse Indgo are very, very old. Thanks for the info. Yes I am referring the tutorial. I would say for first timers it's bit difficult to understand as it misses some minute details but overall I liked the tutorial. Also, I have few more queries for which I will post new thread. We really do appreciate feedback. If you are a first timer then I would highly recommend going through the main SOAtest tutorial in the User's Guide prior to following the SOAtest-Cucumber tutorial. Concerning Indigo, I wanted to clarify some additional things. Admittedly, the tutorial nor the SOAtest-Cucumber java module was written nor verified for such older version of SOAtest/Eclipse. SOAtest 9.6 was last updated (9.6.4 release) in May of 2014. There have been about eighteen newer versions of SOAtest released since then (including minor and service releases). There are definitely older versions of SOAtest that won't work at all with the SOAtest-Cucumber java module, since it depends on certain APIs being available in the SOAtest Server. So, I can't say offhand whether 9.6 would work (maybe it will but maybe not). Feel free to share any additional feedback with us. I managed to get the latest version of Parasoft SOATest 9.10. While trying to install Maven integration for eclipse I am getting error. Can you please share the link which will go with it? Earlier I was referring to Indigo because it was Parasoft 9.6 & now I switched from Parasoft 9.6 to Parasoft 9.10 which I think is Neon. I used m2e for Neon but it didn't work. I used m2e for Neon but it didn't work. The tutorial mentions using the update site for neon because using the latest m2e update site won't work with neon (latest seems to work fine with oxygen). Perhaps you can try un-installing and re-installing SOAtest and try again with the neon update site? If that doesn't work then perhaps you can provide detail about what error you are seeing. Thanks for the info. I managed to install m2e plugin for eclipse. Now I am stuck at the other step. There's a step in tutorial where Maven project automatically download the dependencies to build the project. In my case it's not happening. Is there anything needed to be added manually to make it work? Errors running builder 'Maven Project Builder' on project 'parabank.cucumber'. Right click on the project then click Maven> Update Project.... Next, enable Force Update of Snashots/Releases and the other three boxes below it then click OK. This will force m2e to try to re-download the dependencies and clean and re-build the project. m2e should be pulling those from the central maven repository, provided you have Internet access. Select Help> Install New Software.. In Work with type http://download.eclipse.org/releases/neon then press the Enter key. Wait for the list of Categories to load. This may take a minute or two. 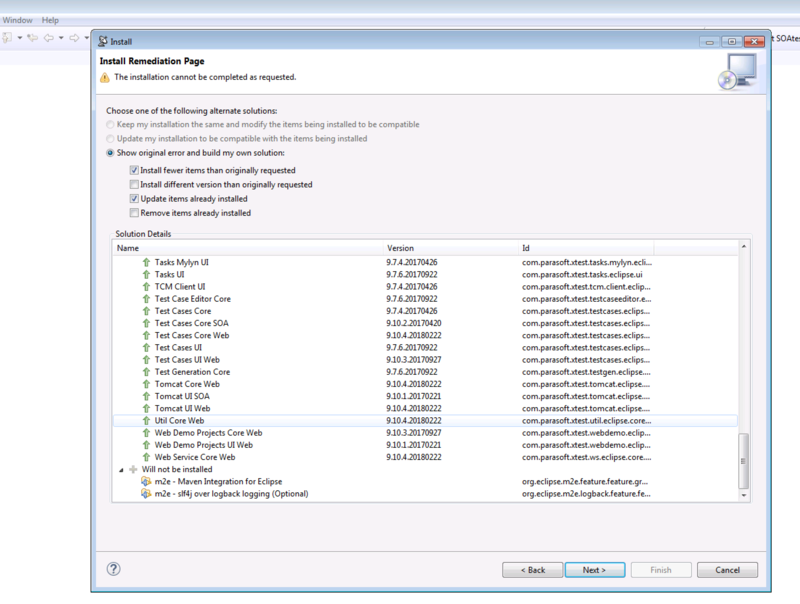 Expand General Purpose Tools, select m2e - Maven Integration for Eclipse, then click Next. Click Next again, accept the open source license agreement, then click Finish. Wait for the plugin to install then click Yes to restart SOAtest when prompted.